Directions: From the west take U.S. Highway 199 past Hiouchi, turn right to cross the middle and south forks of the Smith River on South Fork Road. The western trailhead is 9.2 miles from the turn off from HWY 199 to South Fork Road. Continue up South Fork Road for one mile to start at the ford segment or drive five miles to Big Flat Campground to reach the eastern trailhead at Big Flat Campground. You can also connect to the trail at Chimney Flat, Fox Flat or on Road 15N11, a branch off of Big Flat Road. No map currently shows the new trail sections. Your best bet is to buy the National Geographic Redwood National and State Parks map and stop by the US Forest Service Visitor Center, (707) 457-3131, in Gasquet where they can give you more information. Trail signs are scheduled to be installed winter 2011-2012. Work has recently been completed on the entire seven mile stretch of the Old Kelsey Trail between Boulder Creek and Big Flat Campground. It is ready for visitors to walk, bike or ride horses on any part of it, or use it to connect with the Coast to Crest Trail linking the Coastal Trail with the Pacific Crest Trail. The historic route that the Kelsey trail follows runs along the Smith River and into the Siskiyou Mountains, and was originally a route followed by native people, then in 1855 Ben Kelsey was contracted to construct a trail from Crescent City to Fort Jones to keep the Fort supplied with food and essentials. It also connected Scott Valley, Yreka and other Siskiyou mountain camps. Mule trains of 30-40 animals were used to carry supplies through the rocky river canyons and over steep passes. Unlike a horse’s scraping hoof, a mule’s gait stamps straight down with all its weight, making it the ideal weight bearing beast for the narrow and winding trail that was the original Kelsey route. A side effect of the mules was compaction of the trail from their hooves into such a dense surface that much of the original trail from over 100 years ago is still intact and visible today with no vegetation growing up through it. The trail was used until 1909 when Highway 199 was completed along the Middle Fork Smith River making travel by stagecoach possible and easier than the wild mule trek through the mountains. Resurrecting the trail was the idea of local Clarke Moore, who was humbly searching for a better path between his house on Boulder Creek and a swimming hole on the South Fork Smith when he stumbled onto a part of the old trail. When Moore researched the history of the Kelsey Trail, he discovered its historic role as part of the larger trail system of California. He saw the opportunity for more than just a trail to a beautiful swimming spot on the Smith River. “This is the bridge we have to the past and the one that can take us into the future” he said when asked why the trail became important to him. Abundant fish and wildlife, mining scars and re-grown clear cuts are clues that teach us why this area was important to early people. It is special and important to us now, as a place to retreat, slow down and recharge our spirits with wildness and beauty. With funding from the California River Parkway Grant Program and the support of Rose Foundation project manager Kevin Hendrick, Moore became the Coast to Crest Trail supervisor, and along with Don Pass of the US Forest Service did most of the original scoping for the revival of the Old Kelsey Trail. This was a grueling task which required scrambling through dense brush and thickets that had overgrown the trail, concealing it in many places. Some stretches of trail were too steep to be enjoyable for hikers or had slid out completely and had to be rerouted. 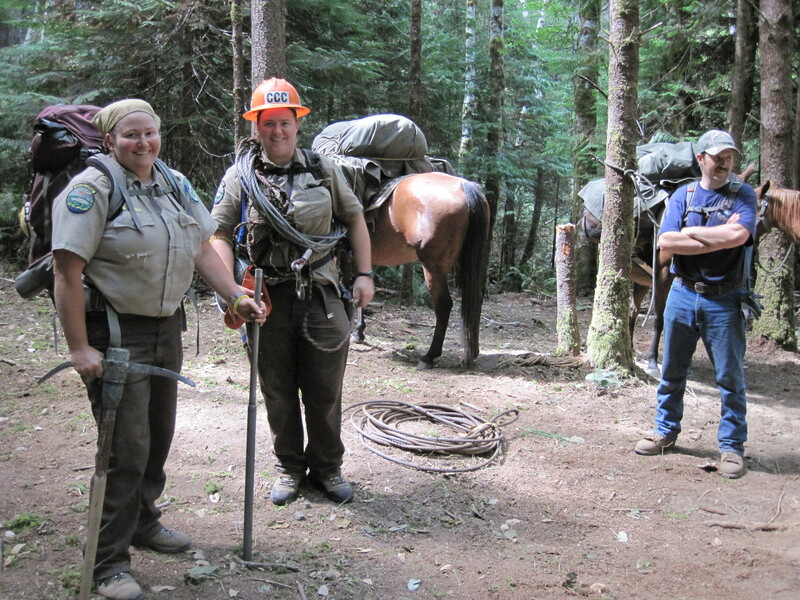 The California Conservation Corps (CCC) went to work after the path had been found and flagged. They dug, chopped and constructed their way through the miles creating a well built freshly cleared trail. Today there are two main trailheads for the Old Kelsey Trail; one is 9.2 miles up the South Fork Road from the turn off from HWY 199 and another is at the Big Flat Campground on Road 405 off Big Flat Rd. Trail map signs and information will be installed at the trailheads this fall. Shorter sections of the trail can be accessed by South Fork Road and Road 15N11, an unpaved branch off of 405 (the Big Flat Campground road). The Ford to Canthook section of trail is accessed at approximately mile 10.2 on South Fork Road. 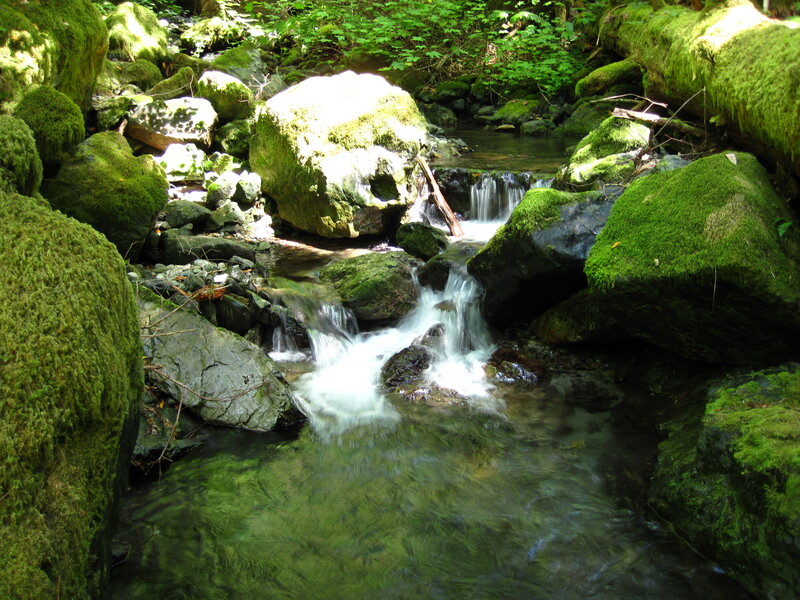 From the ford, this section of trail follows Cant Hook Creek upstream past a few forgotten Douglas Fir and Port Orford Cedar giants before marching up and over a ridge into densely forested hillsides of the Hurdygurdy Creek basin. These unusual place names are drawn from tools used during the period of resource extraction from the area. A hurdy gurdy is generally thought of as an instrument, but in this case hurdy gurdy refers to a water wheel with radial buckets driven by a jet for use in mining. Cant hooks were used in logging and consist of a long wooden handle with a movable hook at one end. The “ford” part of the trail comes about a mile after dropping back down from South Fork Road and is quite literally fording across the South Fork of the Smith River, making this section something you would only want to attempt at low water. If you don’t bring sandals for the crossing prepare to get your shoes wet because the water, even when low, can still be 2 ½ feet deep and the rocky bottom makes it dangerous to traverse barefoot. Reaching this ford could be a worthwhile destination for those who are forever in search of yet another great swimming hole. Rock hopping downstream from the shallow ford on the opposite bank takes you to a deep pool armored by steep rock walls. The best way to enter this pool is to make like a river otter and slither your way down a cobble bar into the deep blue oasis. This glittering pool is a fabulous destination on a hot day. Continuing east from the ford, the trail weaves through a mosaic of giant old growth Douglas Fir and Port Orford Cedar trees along Canthook Creek. Big boulders and logs for resting on at the crossing points over Canthook Creek make for good lunch spots along the trail. Lyrical sounds of water and small cascading waterfalls provide a scenic and relaxing backdrop. Climbing up the trail and into the Hurdygurdy basin you move into another realm with densely growing Douglas Fir and only wisps of filtered light reaching the forest floor. This area was once logged and replanted, but then neglected of further thinning, leaving the trees to grow tall and spindly instead of broad and healthy. The Forest Service plans to thin the trees which will rejuvenate the stand with light and greater diversity. A final crossing over Hurdygurdy creek leads to Fox Flat. Here the trail becomes one with the All Access Trail and over the next couple of miles winds its way back to Big Creek Campground via Chimney Flat. With the closest trailhead only thirty minutes from Crescent City, these seven miles of trail take hikers through a world of diverse forest and riparian habitats, revealing nature’s secrets at a walking pace. Whether hiking this as a day trip or taking the time to travel the entire Coast to Crest you will come away with a sense of renewal from breathing deep of the wilderness and being washed with clean, clear river water.